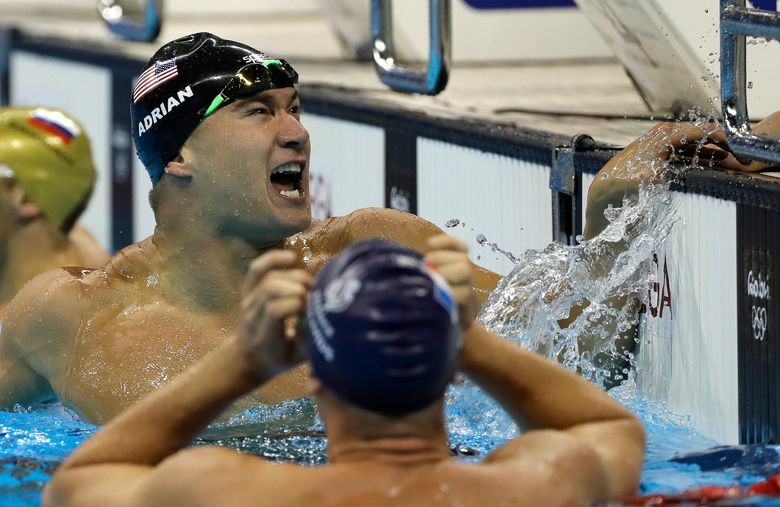 Nathan Adrian of Bremerton won his fourth gold medal and Michael Phelps collected his record 19th as U.S. swimmers won the 4x100-meter freestyle relay Sunday at the Rio Olympics. RIO DE JANEIRO – Nathan Adrian of Bremerton and Michael Phelps will need to clear out more space for their medals. Adrian, 27, won his fourth gold medal. He swam the anchor leg for the U.S. 4×100-meter freestyle relay team Sunday. Phelps got his 19th gold. The most decorated athlete in Olympic history added to his staggering haul, giving the United States a lead in the relay race it never relinquished. Defending Olympic champion France was out front when Phelps dived into the water on the second leg, taking over for leadoff swimmer Caeleb Dressel. Even though the 100 free isn’t one of Phelps’ specialties — he has never swam it individually at the Olympics, only in the relays — he blazed down and back in a stunning 47.12 seconds, a time that was faster than all but the three anchors on the medal-winning teams, three of the best in the world at that distance. Ryan Held kept the Americans in front before giving way to Adrian, the nation’s best sprinter. At that point, the outcome wasn’t really in doubt. But Phelps wasn’t taking any chances, pounding the starting block and shouting toward Adrian as the anchor made the turn for home. When Adrian touched the wall first in 3 minutes, 9.92 seconds, Phelps thrust his right arm in the air and looked toward his infant son, Boomer, nuzzling in the arms of his mother, Nicole Johnson, the roaring crowd blocked out by noise-canceling headphones. Little Boomer won’t remember what his daddy did this night. Olympic rookies Held and Dressel shed tears of joy. It was quite a night for the Americans, who were shut out of the golds on the opening night of swimming. The teenager from Maryland has dominated the longer freestyle events since winning gold in the 800 free at the London Olympics as a 15-year-old. The only drama was whether she would take the world record even lower. Her powerful stroke quickly made that a moot point. Her arms seemingly churning effortlessly through the water, Ledecky touched nearly five seconds ahead of her closest pursuer and quickly whipped around to look at the scoreboard. When Ledecky saw the time — 3:56.46 — she let out an uncharacteristic scream and shook her right fist. She smashed the mark of 3:58.37 she set nearly two years ago in Australia, and had been chasing ever since. Britain’s Adam Peaty set his second mark in as many nights in the 100 breaststroke, while Sarah Sjostrom of Sweden beat her own record in the 100 butterfly.